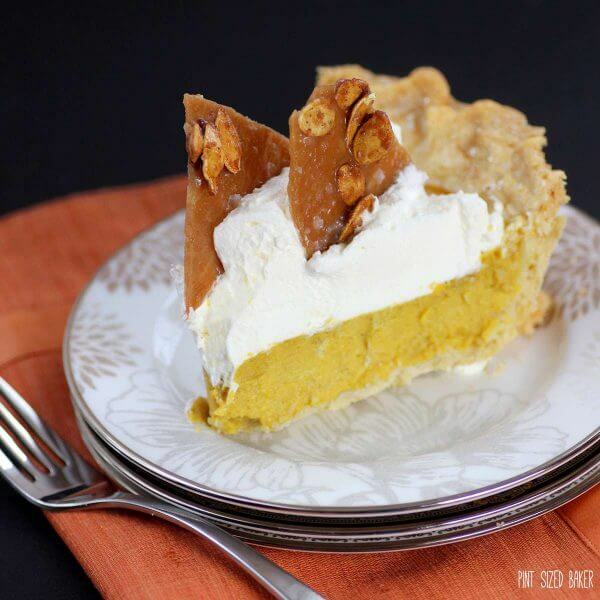 A decadent Thanksgiving Pumpkin Pie (from scratch) made from a whole Pumpkin, baked into an easy lard based crust and topped with sweetened pumpkin seed toffee and Mascarpone whipped cream. 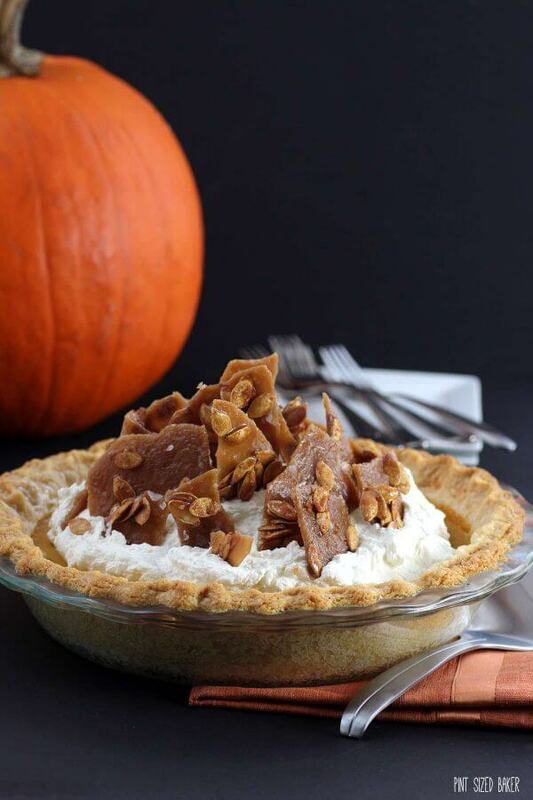 You can choose to make a homemade pumpkin pie or buy a frozen one, but one this is for sure, you’ll need to top it with some mascarpone whipped cream and toffee. It’ll take any basic pie to the next level and totally impress your family and guests for Thanksgiving. 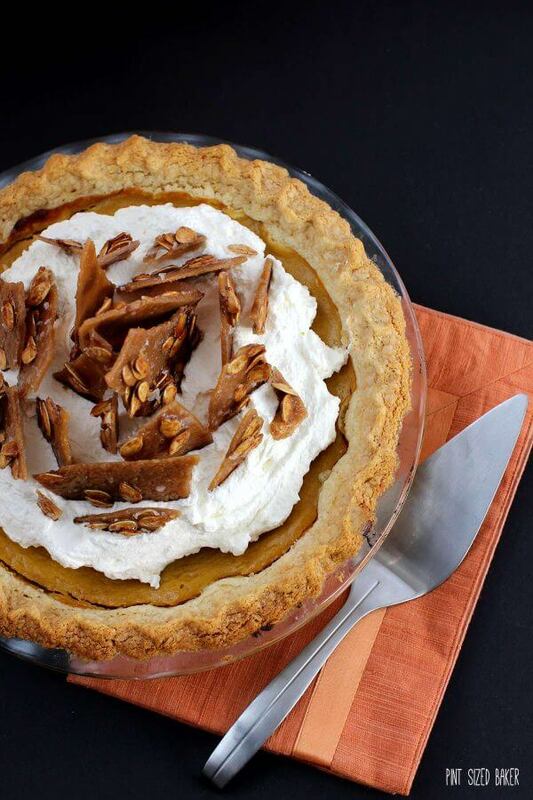 This Thanksgiving Pumpkin Pie is going to be the hit of your dessert table. The amazing buttery flavor and the crispy crunch of the toffee – plus, I added a touch of Maldon sea salt and LOVED it! This recipe is part three of a three part series including Pumpkin Puree and Basic Pumpkin Pie. 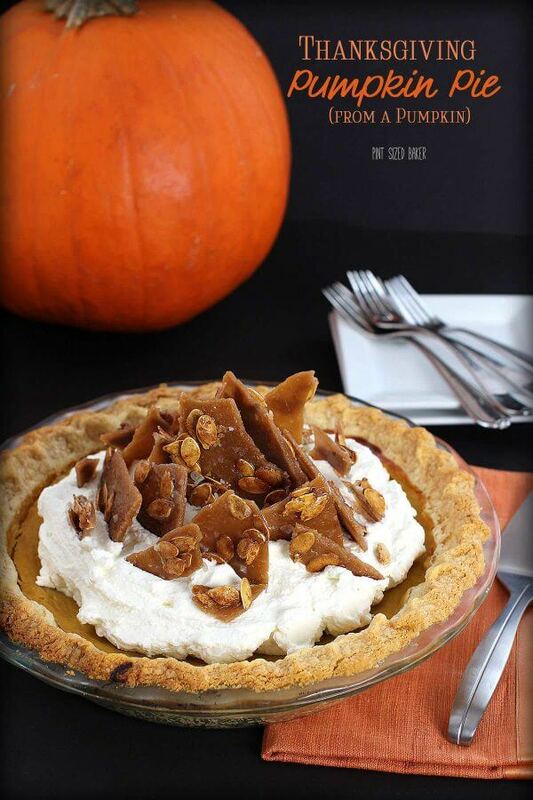 Nothing like classic pumpkin pie! I love that you use fresh pumpkin! And you added toffee? WHOA!! Oooh, the mascarpone is the perfect touch! 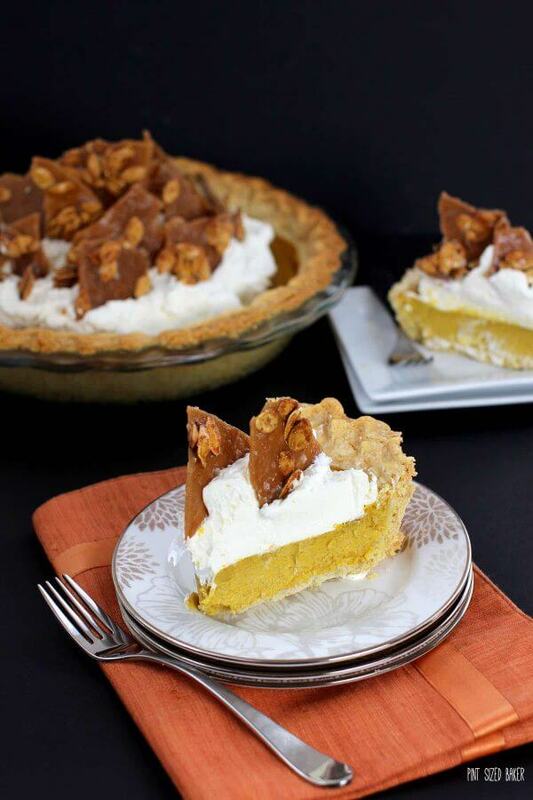 I love how you elevated this classic pie with some toffee! is needs to be served at our Thanksgiving this year! 🙂 Me too. I figure if someone wants to dress up a frozen pie, this would be a great way to do that!! Love that you used a real pumpkin! Me too! It was so good. Absolutely love the mascarpone cheese on top! That is my all-time favorite cheese! I love that you used mascarpone! I love using that stuff whenever possible. And that topping – just wow! The mascarpone adds so much great flavor to basic whipped cream. This is such a gorgeous pie! I love the toffee chunks on top! I never would have thought to put toffee on top! I love that idea! I love how it turned out. You can also add it to a premade pie and make it look amazing! Yum! 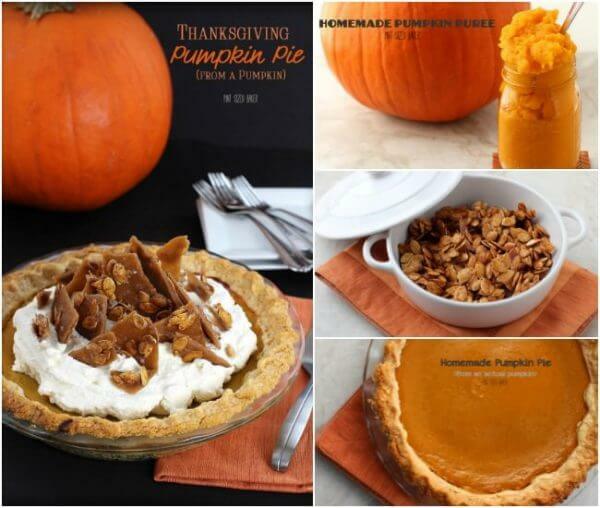 I love this version of a Pumpkin Pie. Especially the toffee and pumpkin seeds on top. thanks so much. 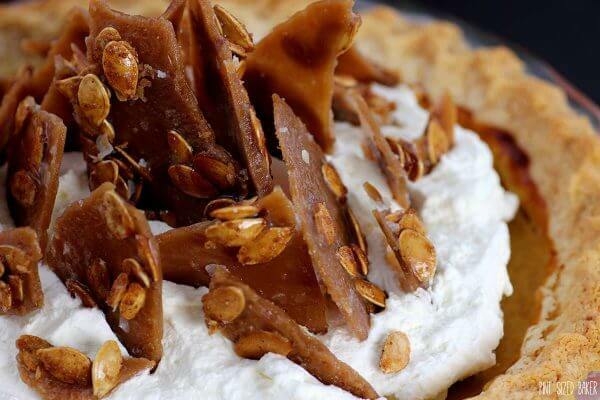 Even if you just buy one from Costco or your grocery store, you can still make the whipped cream and toffee and everyone will be super impressed!